Action from Poole Town 3, Merthyr Town 1 last Saturday. Home team Poole are in red and white kit. Merthyr Town head to Buckinghamshire this afternoon still planning a big finish to their EvoStik Southern League season. 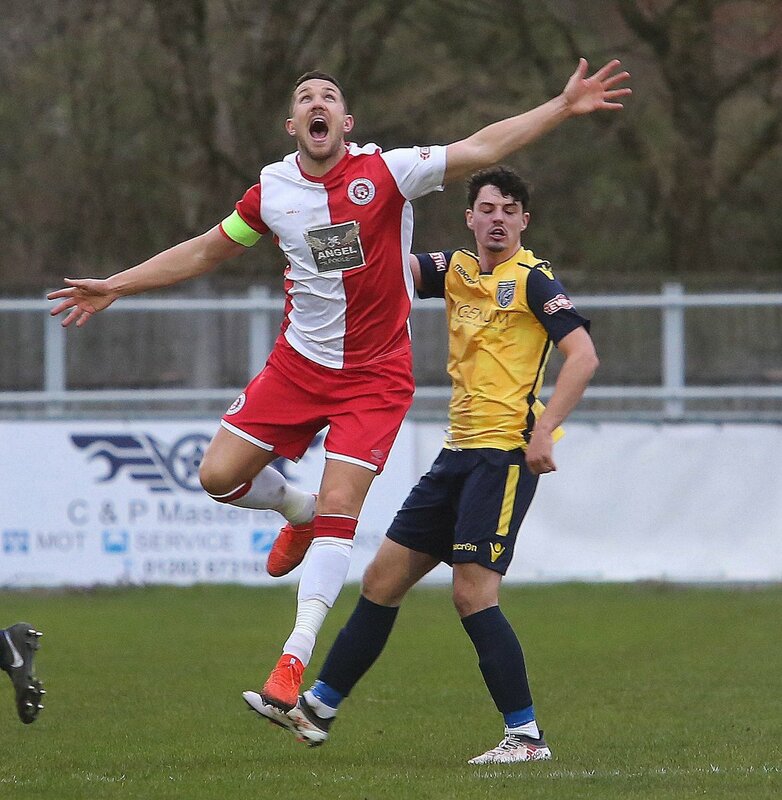 The Martyrs take on Beaconsfield Town, who won the Southern League Division One East title and promotion last season, on Tuesday at their Holloways Park ground. Manager Gavin Williams and his team are adrift of the play-off positions with eight Premier Division fixtures left and are aiming for a big push starting at Beaconsfield. Former Egham Town, Northwood, Wingate & Finchley, Beaconsfield SYCOB and Burnham manager Gary Meakin is in charge of the home team, who were thumped 4-0 at Swindon Supermarine in their last fixture. Merthyr were without injured trio goalkeeper Lewis Webb, defender Matthew Harris and centre-forward Ryan Prosser during their 3-1 defeat at Poole Town last Saturday. Teenage Swansea City goalkeeper Scott Reed, aged 18, stepped in to help the Martyrs at Poole and is likely to feature again at Beaconsfield. Merthyr have eight games left – four at home and four away – and are at home against bottom team Staines Town on Saturday. Surrey-based Staines, nicknamed the Swans, have a declared aim to achieve Football League over the next decade, but that plan is not going well. Action: Poole Town v Merthyr Town. They are bottom of the Southern League Premier Division South, 21 points behind the next club above them, and have already been relegated. Staines have earned four wins in 35 fixtures and have a goal difference of minus 82. Next season they will be playing in the eighth tier of the English pyramid system. Merthyr Town have eight League fixtures left, four at home and four away.